Tourists are encouraged to visit the islands of Pulau Dayang Bunting, Pulau Singa Besar and Pulau Beras Besar. There is, however, nothing to stop you dropping anchor at most of the other islands which the locals, understandably, like to keep to themselves. 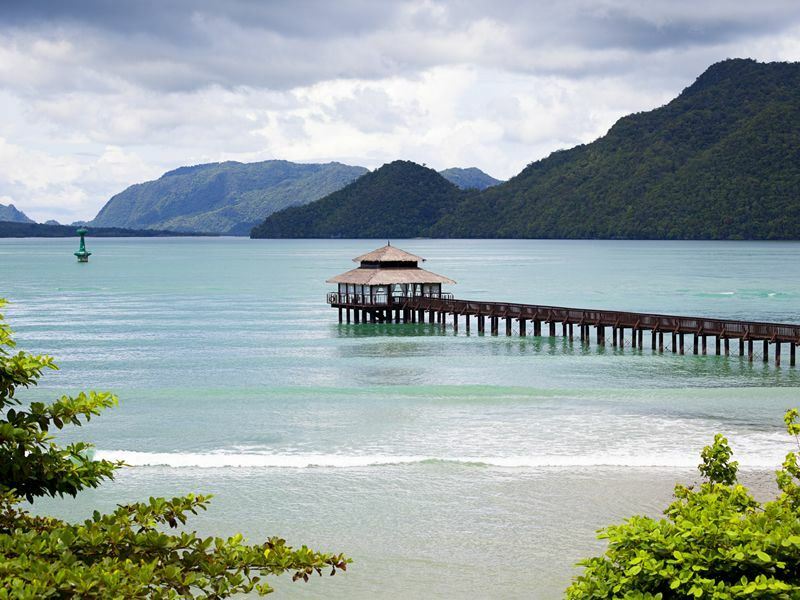 If you are travelling from the UK for a family holiday to Langkawi, the likelihood is you will be quite content to stay on the main island of Langkawi and possibly travel by day-boat trips to some of the more remote islands. There is plenty to do and caters for tourists more – by that I mean there are shops and a choice of restaurants. It’s an uncomfortable fact that whilst I used to be the person who wanted to get as far from civilisation as possible, I now appreciate an ice-cube in my drink. The ageing process is an interesting one when considered from a travelling point of view; definitions of comfort change, which I’m not wholly comfortable with acknowledging! Langkawi feels like Bali did decades ago – there is a sweetness and sincerity that I find lacking in Bali but is definitely found here. The Andaman Sea provides great snorkelling and diving and you’ll love taking a kayak out and just slipping overboard to snorkel around the wonderful coral beds. In terms of accommodation, the famous Datai and sister hotel The Andaman next door, are popular with luxury holiday makers and their families. They are exactly what you hope them to be, refined Asian elegance with every whim catered for. The spa is beautiful here and however long you’re holidaying for, it never feels like enough. Huge monitor lizards live around the greenery which frames the pool and slides at the Andaman – I had the shock of my life when I picked our big beach bag up and there was a lizard inside! Jurassic Park eat your heart out. To the north of the island there are a welter-weight of fine hotels which don’t seem overdone or pretentious and are nestled into the vegetation so that the jungle doesn’t seem to stop before it hits the beach. The architecture is very sympathetic and it is a testament to the building guidelines on the island that the small bays rarely feel cluttered by hotels. There are some great family hotels with a big international feel – the Sheraton Perdana springs to mind. Occasionally there is a feeling that you are in an episode of Home & Away, but nothing like the prevalence of Aussies down at Nusa Dua in Bali. Try the cable car ride which goes to the top of the Machincang mountain range, 708m above sea level. From the peak, you can see all 99 islands and look down at the forest canopy. Within the forest there are waterfalls to climb, then dive into clear crystal waters – and also loads of monkeys everywhere. Don’t leave your bags unguarded, the monkeys just take what they fancy, food or cameras! I found it the best to wear our swimming stuff, put shorts and t-shirt on top (plus hat) and to carry water. It’s so hot you’ll dry really quickly. For food, the hotels offer lots of different options which are great but can come at a price, alternatively try The Bon Ton restaurant which does good barbecue rock lobster for around £20 a head, including wine. I also recommend eating Japanese on Lagkawi, which is good value and plentiful. Street food is delicious and the perfect pick-me-up for lunch. The only thing our children were squeamish about was the selecting of lobster from a tank and then it being cooked – a bit real. I can thoroughly recommend both Malaysia and Langkawi as ideal holiday destinations – unless you have about three weeks it would be difficult to combine both (and experience anything – of course there are always people who seem to zip through countries). Langkawi is a destination in itself and there is always the feeling that somehow it won’t always be this beautifully simple – that tourism may catch up with it and bite it.